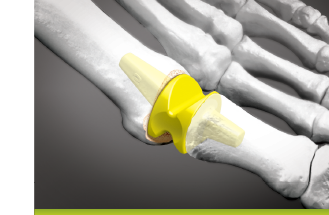 The Reference Toe System for first metatarsophalangeal joint arthroplasty is manufactured from medical grade silicone elastomer with titanium grommets. A longitudinal incision is made over the first metatarsophalangeal (MTP) joint, just medial to the extensor hallucis longus tendon. The incision is deepened to the joint. A dorsal medial capsulotomy is performed and the joint is dissected free on the dorsal and medial aspects. All hypertrophic bone is resected from the first metatarsal head and the base of the proximal phalanx. Using a surgical saw, osteotomies are then performed perpendicular to the weight bearing surface to enable complete resection of the articular surfaces from the first metatarsal head and base of the proximal phalanx. All resected bone surfaces are smoothed with a rasp. 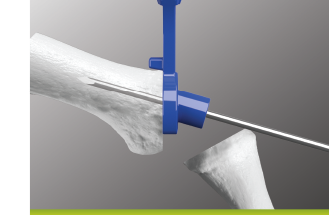 If desired, the Implant Sizer may be used to estimate the overall width of the osteotomy for the anticipated size Implant. 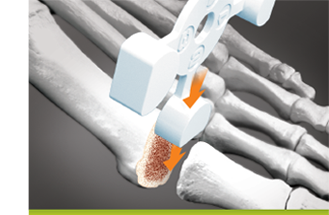 The Implant Sizer is positioned against the resected metatarsal bone with the numbered side facing toward the user. The Implant size closest to the bone size (without being larger) is chosen. 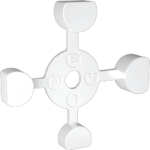 The four Sizer “heads” each correspond in thickness, diameter, and overall general shape to the proximal face of the four Implants. 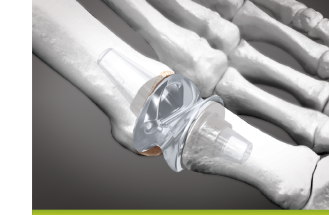 Note: If a size 1 or 2 Implant is chosen,the RTS Size 1-2 Instrument Kit is selectedand opened. 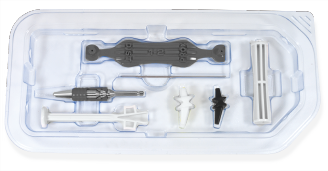 If a size 3 or 4 implant ischosen, the RTS Size 3-4 Instrument Kit is selected and opened. 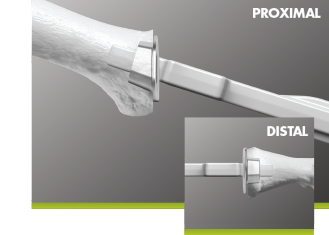 *The provided Wire Guide in the designated size is selected and the end labeled “PROX” is positioned against the resected metatarsal bone. 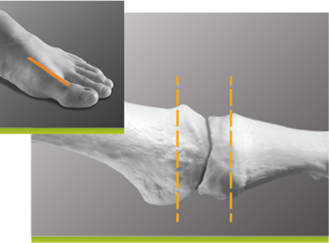 Ensure the stop tab of the Guide is seated on the dorsal surface of the metatarsal. This will help stabilize the Guide and properly place the Guide Wire. The .062×4” Guide Wire is driven through the guide and into the canal. Use x-ray to check Guide Wire position; the Wire should be centered in the canal and parallel to the dorsal surface of the metatarsal shaft. If positioning is not correct, remove and reposition before proceeding. Note: *Due to anatomic variations, the use of the Wire Guide may not be optimal for guide wire placement. 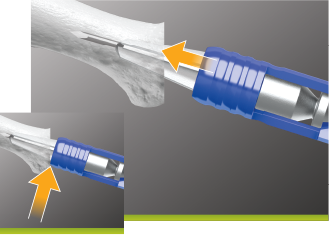 A careful freehand insertion of the guide wire may be used as an alternative to ensure the wire is positioned in the center of the bone canal. Wire placement should be confirmed using an x-ray image. 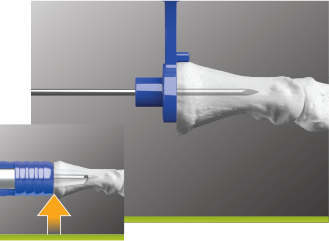 The corresponding size cannulated Reamer with attached Reamer Depth Guide set to the proximal position is driven over the Wire, reaming the bone until the depth stop engages the resected metatarsal surface. The Reamer and Guide Wire are then removed. *Repeat drilling and reaming procedures for the distal side of the joint in the proximal phalanx. 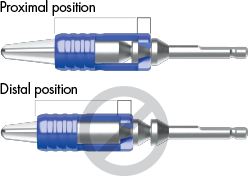 The Wire Guide “DIST” end is positioned against the resected proximal phalanx bone and the .062×4” Guide Wire is driven through the Guide and into the intramedullary canal. The Reamer Depth Guide is moved to the distal reamer position for distal reaming using the same Reamer. *Note: Due to anatomic variations, the use of the Wire Guide may not be optimal for guide wire placement. A careful freehand insertion of the guide wire may be used as an alternative to ensure the wire is positioned in the center of the bone canal. Wire placement should be confirmed using an x-ray image. Joint preparation is checked with the Trials provided in the Instrumentation Set. Note: Trial Implant stems may seem slightly loose in the absence of the Grommets. 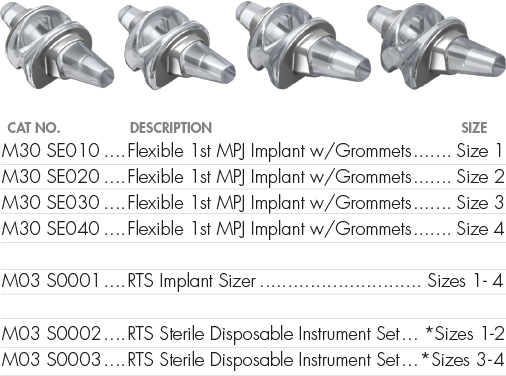 Once the sizing has been finalized, the corresponding size RTS Flexible 1st MPJ Implant w/Grommets package is selected and opened. Each package has a label marked with the size and color corresponding to the Implant Trial for easy identification. The grommets are removed from the tray and placed using the Grommet Placer instrument. 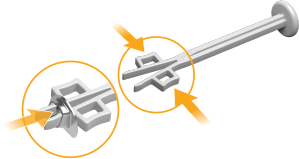 The finger contacts are oriented at the Medial/Lateral grommet axis. These are compressed to remove the Grommet Placer from the grommet after insertion. For hard bone, a separate dedicated Grommet Impactor may be used to fully seat the grommet if necessary. These instruments are used for both proximal and distal grommets. 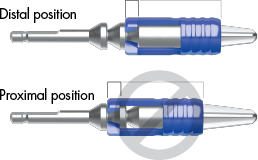 The silicone Implant proximal and distal stems are then inserted* into the corresponding grommets. ROM is confirmed and the joint is closed per the surgeon’s preferred method. * Important – HANDS ONLY insertion: Do not use forceps or other instruments to grab, grasp and/or insert the Silicone RTS Implant. 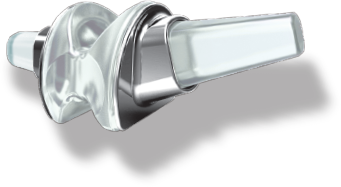 Use of instruments to grab, grasp and/or insert can damage the Silicone Implant. All content contained herein is furnished for informational purposes only. i2b-USA does not recommend a particular surgical product or procedure suitable for all patients. Each surgeon must evaluate the appropriateness of a device and corresponding techniques based on medical training, clinical judgement and surgical experience. The proper surgical technique and/or procedure are the responsibility of the medical professional. Indications, contraindications, warnings, and precautions are listed in implant packaging insert and should be reviewed carefully by the physician and operating room personnel prior to any proposed procedure.